China aims to improve the standards and quality of consumer goods by 2020 to raise living standards and prop up domestic consumption as part of the supply-side reform. An executive meeting of the State Council presided over by Premier Li Keqiang on Aug 24 approved a new guideline on improving consumer goods standards and quality for the coming five years. The move was initiated by the General Administration of Quality Supervision, Inspection and Quarantine. Consumption contributed 73.4 percent to GDP growth in the first half of this year, according to figures by the National Bureau of Statistics. In the next four years, the authorities will promote updating present standards and improving the quality of consumer goods, building globally-reputed brands and optimizing the market environment, according to a statement released after the meeting. The meeting also decided to establish a negative list for the production, and businesses related to consumer goods, lift restrictions on market access, as well as promote information-sharing of quality supervision. To achieve the goals, the government will grant more financial and regulatory support for developing the sector. 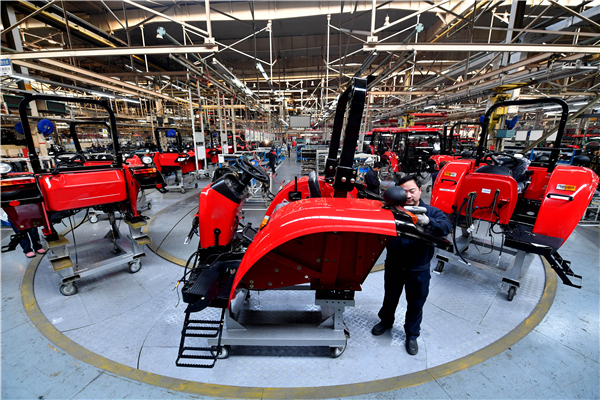 Internationally advanced standards will boost the quality of consumer goods and stimulate upgrading of equipment manufacturing, which are key to the strategy of “Made in China 2025”, said the statement. It also said that these measures are expected to expand effective demand and raise people’s living standards based on the huge domestic market. The criteria for consumer goods still lag behind the growing demand of domestic consumers. Chinese brands still have a long way to go to when building up their international competitiveness. By 2020, standards of consumer goods are expected to reach, or approximate, international standards in key areas, Tian Shihong, president of the Standardization Administration, said over the weekend. The value of well-known Chinese brands will be significantly enhanced, he added. “After 30 years of reform and opening-up focusing on economic development, people no longer just want food and accommodation but thirst for goods that can make their lives easier, more comfortable and inspiring,” said Xia Xueluan, a professor of sociology at Peking University. “As the number of middle-class families increases, the high-end market is expanding fast, which drives the government to focus on basic demands and high-end ones too,” said Feng Liguo, a researcher at the China Enterprise Confederation. Meanwhile, much of domestic consumption was attracted to overseas markets in developed economies where standards and quality of goods can out-do those sold at home. Chinese tourists spent 1.5 trillion yuan ($226 billion) while traveling in other countries last year, half of the expenditure went to shopping, according to the Ministry of Commerce. Chinese consumers now desire higher-quality goods than before and domestic manufacturers should understand the changing demand as well as perfect current technologies and pursue new ones to make better products, said Huang Qunhui, director of the Institute of Industrial Economics at the Chinese Academy of Social Sciences. In addition, Chinese investors and buyers were estimated to purchase overseas real estate properties with $150 billion last year, said Wang Jianlin, chairman of Wanda Group, a Dalian-based developer. All together, Chinese buyers spent more than 2.5 trillion yuan ($374.4 billion) overseas last year and this spending should be drawn back only with higher-quality products, Wang said. “We must be sober about this phenomenon, that it’s impossible to restrict or stop Chinese spending overseas. But we can find ways to win their purchasing power back,” Wang said.